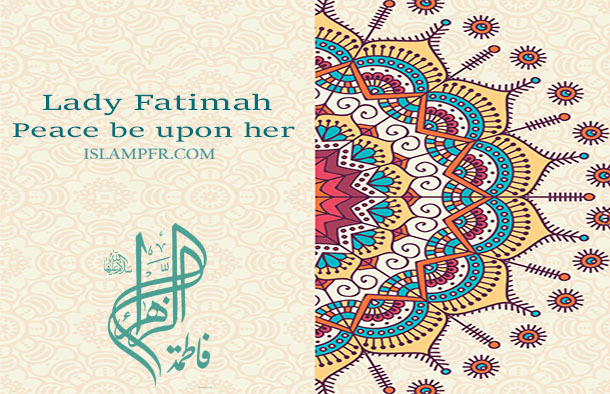 Lady Fatimah (pbuh) is an inspiring example and the name Fatimah is one of the most popular girl’s names throughout the Muslim world. She was involved in three significant political actions, each recorded in almost all sources. after prophet Muhammad (pbuh)’s Martyrdom, she defended Imam Ali (pbuh)’s cause, fiercely opposed the election of Abu Bakr, and had violent disputes with him and particularly with Omar; Third, she laid claim to the property rights of her father and challenged Abu Bakr’s categorical refusal to cede them, particularly Fadak and a share in the produce of Khyber. She martyred a few months after her father’s martyrdom, but the exact location of her grave is unknown. She died as a result of her injury caused by Omar, incurred while defending Imam Ali (pbuh) against Abu Bakr. Lady Fatimah (pbuh) was born in Mecca to Lady Khadijah. There are differences of opinion on the exact date of her birth, Sunni scholars believe she was born five years before “Biʿtha” (selection of prophet by God for guidance of people), and Shia scholars believe she was born 5 years after “Biʿtha”. during the time of the rebuilding of the Kaba in 605 A.D, although this does imply she was over 18 at the time of her marriage. Shia sources are Ahl Al-bayt’s words. Shia knows her birthday on 20th Jumadi Al-Sani. Lady Fatimah (pbuh) is given many titles by Muslims to show their admiration of her moral and physical characteristics. The most used title is “Zahra”, meaning “the shining one”, and she is commonly referred to as Lady Fatimah Zahra (pbuh). She was also known as “Batul” (the chaste and pure one) as she spent much of her time in prayer, reciting the Quran and in other acts of worship. Following the demise of her mother, Lady Fatimah (pbuh) was overcome by sorrow and found it very difficult to come to terms with her demise. She was consoled by her father, who informed her that he had received word from angel Gabriel that God had built for her a palace in paradise. Many of Prophet Muhammad (pbuh)’s companions asked for Lady Fatimah (pbuh)’s hand in marriage, including Abu Bakr and Omar. Prophet Muhammad (pbuh) turned them all down. Imam Ali (pbuh), prophet Muhammad (pbuh)’s cousin, also had a desire to marry Lady Fatimah (pbuh). When he went to see Prophet Muhammad (pbuh), he could not speak about his intention but remained silent. Prophet Muhammad (pbuh) understood the reason for his being there and prompted Imam Ali (pbuh) to confirm that he had come to seek Lady Fatimah (pbuh) in marriage. at that time Imam Ali (pbuh) was between 21 and 25. Prophet Muhammad (pbuh) told Imam Ali (pbuh) that he had been ordered by God to give his daughter Lady Fatimah (pbuh) to Ali (pbuh) in marriage. Also Lady Ftimah (pbuh) agreed, she knew Ali (pbuh) is the best one for her. Imam Ali (pbuh) sold his shield to raise the money needed for the wedding, as suggested by Prophet Muhammad (pbuh). However, Othman Ibn Affan, to whom the shield was sold, gave it back to Imam Ali (pbuh) saying it was his wedding gift to Imam Ali (pbuh) and Lady Fatimah (pbuh). The actual date of the marriage is unclear (because registering was not common then), but it most likely took place in first day of Dhu al-Hijjah. Also The age of Lady Fatimah (pbuh) is unclear it is reported to have been 9 or 19 (due to differences of opinion on the exact date of her birth). Prophet Muhammad (pbuh) said to Lady Fatimah (pbuh): “I have married you to the dearest of my family to me.” . Prophet Muhammad (pbuh) himself performed the wedding ceremony and two of his wives, Aisha and Umm Salamah, prepared the wedding feast with dates, figs, sheep and other food donated by various members of the Medina community. According to Hussein Nasr, their marriage possesses a special spiritual significance for all Muslims because it is seen as the marriage between the greatest saintly figures surrounding Prophet Muhammad (pbuh). Their marriage lasted about ten years and ended when Lady Fatimah (pbuh) martyred. Imam Ali (pbuh) did not marry another woman while Lady Fatimah (pbuh) was alive. After her marriage, Imam Ali (pbuh) had built a house not too far from prophet Muhammad (pbuh)’s residence where he lived with Lady Fatimah (pbuh). For several years after her marriage, she did all of the work by herself. The shoulder on which she carried pitchers of water from the well was swollen and the hand with which she worked the hand mill to grind corn where often covered with blisters. Lady Fatimah (pbuh) vouched to take care of the household work, make dough, bake bread, and clean the house; in return, Imam Ali (pbuh) vouched to take care of the outside work such as gathering firewood, and bringing food. Imam Ali (pbuh) worked to irrigate other people’s lands by drawing water from the wells. Their circumstances were akin to many of the Muslims at the time and only improved following the Battle of Khyber when the produce of Khyber was distributed among the poor. When the economic situations of the Muslims become better, Lady Fatimah (pbuh) gained some maids but treated them like her family and performed the house duties with them. Another reference to their simple life comes to us from the Tasbih of Lady Fatimah (pbuh), a divine formula that was first given to Lady Fatimah (pbuh) when she asked her father for a maid (servant girl) in order to help her with household chores. Her father asked her if she would like a gift instead that was better than a servant and worth more than everything in the world. Upon her ready agreement, he told her to recite at the end of every prayer (Salat, نماز) the Great Exaltation, “Allahu Akbar” 34 times, the Statement of Absolute Gratitude, “Alhamdulillah” 33 times and the Invocation of Divine Glory, “Subhan’Allah” 33 times, totaling 100. This collective prayer is called the Tasbih of Lady Fatima (pbuh). Many Muslims recite it after Salats. Following the Battle of Uhud(Idolaters of Mecca attacked to Muslims. it happened near the Uhud mountain), Lady Fatimah (pbuh) tended to the wounds of her father and husband, and took it upon herself to regularly visit the graves of all those who died in the battle and pray for them. Some verses in the Quran are associated to Lady Fatimah (pbuh) and her family by classical exegetes. she is mentioned by the name “Kowthar” in Quran. According to the interpretations of Imams, and some provable reasones, two of the most important verses include the verse of purification, which is the 33rd verse in Surah al-Ahzab and the 61st verse in Surah Al-i-Imran. In the first verse, the phrase “people of the house” (Ahl Al-Bayt) is ordinarily understood to consist of prophet Muhammad (pbuh), Lady Fatimah (pbuh), her husband Imam Ali (pbuh) and their two sons. The second verse refers to an episode in which prophet Muhammad (pbuh) proposed an ordeal of mutual adjuration (Mubahala) to a delegation of Christians. Lady Fatimah (pbuh), according to the “occasion for the revelation” of this verse, was among those offered by Prophet Muhammad (pbuh) as witnesses and guarantors. Muslim exegesis of the Quranic verse 3:42, links the praise of Mary (pbuh), the mother of Prophet Jesus (pbuh), with that of Lady Fatimah (pbuh) based on a quote attributed to prophet Muhammad (pbuh) that lists the outstanding women of all time as Mary (pbuh), Asiya (the wife of Pharaoh), Lady Khadijah and Lady Fatimah (pbuh). For the few months that she survived following the martyrdom of her father, Lady Fatimah (pbuh) found herself indirectly at the center of political disunity. Different events which had surrounded the issue of the Prophet’s true successor, were the cause of the Shia and Sunni split. According to the Sunnis the majority of Muslims at the time of prophet Muhammad (pbuh)’s death favored Abu Bakr as the Caliph while a portion of the population supported Lady Fatimah (pbuh)’s husband, Imam Ali (pbuh) . On the other hand, prophet Mohammad had been determined Imam Ali (pbuh) as his successor in Qadir Khum by the order of God. Thus there was no need to consensus, because Imam Ali (pbuh) was established as Imam, leader and Caliph by Prophet Mohammad(pbuh), before. Following the selection of Abu Bakr to the caliphate after a meeting in Saqifah, Abu Bakr and Omar with a few other companions headed to Lady Fatimah (pbuh)’s house to obtain allegiance from Imam Ali (pbuh) and his supporters who had gathered there. Then Omar threatened to set the house on fire unless they came out and swore allegiance with Abu Bakr. Shia historians hold that Omar called for Imam Ali (pbuh) and his men to come out and swear allegiance to Abu Bakr. When they did not, Omar broke in, resulting in Lady Fatimah (pbuh)’s ribs being broken by being pressed between the door and the wall and causing her to miscarry Muhsin (pbuh) which led to her eventual martyrdom. Then he set fire to the house. Following the Farewell Pilgrimage, Prophet Muhammad (pbuh) summoned Lady Fatimah (pbuh) and informed her that he would die soon, and also told her that she would be the next of his family to die. After prophet Mohammad’s passing, Lady Fatimah (pbuh) was grief-stricken and remained so until her herself died less than six months later, on 10th, Jumada al-awwal . Lady Fatima (pbuh)’s anger with Abu Bakr remained untill her death. it is also written in some Sunni books such as Sahih Bukhari( Volume 3), However Sunnis believe that Lady Fatimah (pbuh) reconciled her differences with Abu Bakr prior to her martyrdom! Sunni scholars say she died as a result of separation from her beloved father. But Shia scholars according to the words of Imams and also historical documents say that Lady Fatimah (pbuh) died as a result of injuries sustained after her house was raided by Omar Ibn al-Khatab who threatened to set fire to the house. Fearing death of her small sons, Lady Fatimah (pbuh) approached the door to open it. The door was rammed open by one of the assailants knocking Lady Fatimah (pbuh) to the ground. This attack is said to have cracked her rib-cage whilst she was pregnant, causing her to miscarry. According to Shia tradition, Prophet Muhammad (pbuh) appeared in a dream and informed Lady Fatimah (pbuh) that she would be passing away the next day. Lady Fatimah (pbuh) informed her husband Imam Ali (pbuh) of her impending death, and asked him not to allow the oppressors to be involved in her ceremonial prayers (prayer performed in congregation after the death of a Muslim) or take part in the burial. Some sources have stated that her two sons were the first family members to learn of her death and immediately proceeded to the mosque to inform their father. Upon hearing the news, Imam Ali (pbuh) fell unconscious. After recovering he followed Lady Fatimah (pbuh)’s wishes. He buried her during the night on 13 Jumada al-awwal (about 630 AD), also making three false graves to ensure her real grave could not be identified. With him were his family and a few of his close companions. Shia, especially Iranians, hold ceremonies every year for 20 days in Jumada al-awwal to commemorate the anniversary of the martyrdom of Lady Fatimah (pbuh). The Sunnis state that on the morning of her death, she took a bath, put on new clothes and lay down in bed. She asked for Imam Ali (pbuh) and informed him that her time to die was very close. Upon hearing this news, Imam Ali (pbuh) began to cry but was consoled by Lady Fatimah (pbuh) who asked him to look after her two sons and for him to bury her without ceremony. After her martyrdom, Imam Ali (pbuh) followed her wishes and buried her without informing the Medinan people. Lady Fatimah (pbuh)’s burial place is a disputed issue among Muslims from different sects. It is said that Imam Ali (pbuh) buried his wife in an unknown location, because it was Lady Fatimah (pbuh)’s decision. The secret burial was done with the aim of avoiding the presence of Caliph Abu Bakr. Different locations have been mentioned as the possible burial place of Lady Fatimah (pbuh) some of which are said to be nearer to fact. Al-Baqi’, her house and between the Prophet’s tomb and his minbar (the place that the prophet was sitting on to preach) are the possible place of her grave. Lady Fatimah (pbuh) had two sons, Hassan (pbuh), Husain (pbuh), and two daughters, Zaynab (pbuh), Umm Kulthum (pbuh), And her third son who was aborted, Muhsin(pbuh). Shia and some Sunni scholars say that she miscarried following an attack on her house by Abu Bakr and Omar, but other Sunnis say that Muhsin died in his infancy of natural causes! Modern descendants of Prophet Muhammad (pbuh) trace their lineage exclusively through Lady Fatimah (pbuh), as she was the only surviving child of Prophet Muhammad (pbuh). Prophet Muhammad (pbuh) had no sons who reached adulthood. Lady Fatimah (pbuh)’s descendants are given the honorific titles Sayyid (meaning lord or sir), Sharif (meaning noble), and respected by both Sunni and Shia, though the Shia’s place much more emphasis and value on the distinction. Muslims regard Lady Fatimah (pbuh) as a loving and devoted daughter, mother, wife, a sincere Muslim, an exemplar for women. It is believed that she was very close to her father and her distinction from other women is mentioned in many Hadith. After Lady Khadijah, Muslims regard Lady Fatimah (pbuh) as the most significant historical figure, considered to be the leader of all women in this world and in Paradise. It is because of her moral purity that she occupies an analogous position in Islam to that Lady Mary (pbuh) occupies in Christianity. She was wife of Imam Ali (pbuh), the mother of the second and third Imams, and the ancestor of all the succeeding Imams. Lady Fatimah (pbuh), regarded as “the Mother of the Imams”, plays a special role in Shia piety. She has a unique status as Prophet Muhammad (pbuh)’s only child. The Surah of Quran “kowthar” (‘Abundance’) mentions significance of her birth and recognizes her as the only child of Prophet Muhammad (pbuh). She was immaculate, sinless and a pattern for Muslim women. Although leading a life of poverty, it is narrated about her compassion and sharing of whatever she had with others. Shia greatly respects and adores her sublime personality. In fact her character outshines as one of the most brave and courageous personality in Islamic history. Lady Fatimah (pbuh) stood as the lone defender of Prophet Muhammad (pbuh)’s declaration of Qadir. She forwarded her arguments to prove Fadak as her right and undisputed property, amongst those who had killed her unborn child Muhsin. There are Shia Muslim traditions that can be found in Usul al-Kafi about a book called “Mushaf of Lady Fatimah (pbuh)”, which speaks of Lady Fatimah (pbuh) upon the passing of her father, Prophet Muhammad (pbuh). There are several versions of this tradition, but common to all are that the angel Gabriel appeared to her and consoled her by telling her things (including future events regarding her offspring) that she wrote in a book. During these revelations, Imam Ali (pbuh) acted as the scribe for Lady Fatima (pbuh). According to one tradition, Imam Mahdi (pbuh) will reveal the book in his return. I think you have done sth wrong.look at the picture again.You have written peace be upon him.However Fatima(pbuh)is a woman!